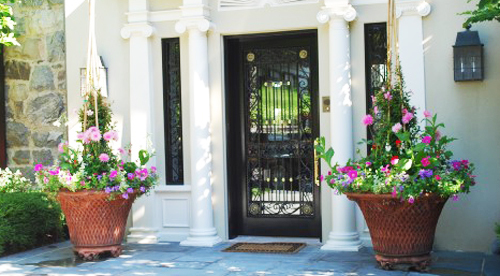 Dressing up your front doorway with pots, flowers, and shrubs of foliage and color is fun and a creative way to add to your home's personality. Potting in front is a way to express your tastes and suggests how the rest of the house is decorated. Here are a few quick and easy ideas. Colorful ceramic is great when you need brightness. Use terracotta for traditional and simple plant materials. Use terracotta for a more casual look because their lines are cleaner and less decorative. Try to use containers that fit the size of the area surrounding your entryway. 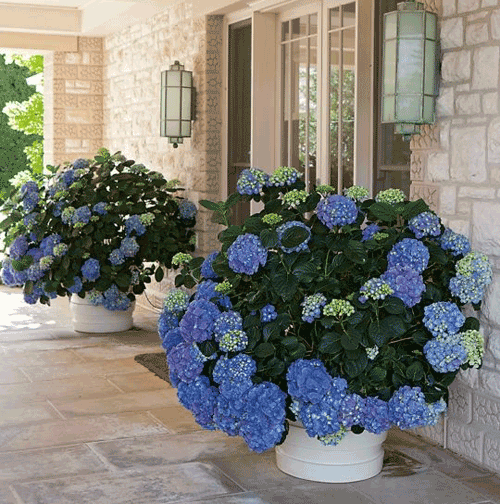 Flank the front door with urns, or line the steps with smaller pots and planting containers. If landing space is limited, think vertically by using on or two hanging planters. Try to create an arrangement of mixed plant materials that vary in height. Use plant stands to raise pots off the surface and add some added character. If you unsure about the design, work with similar plants and pots so you can create some unity. 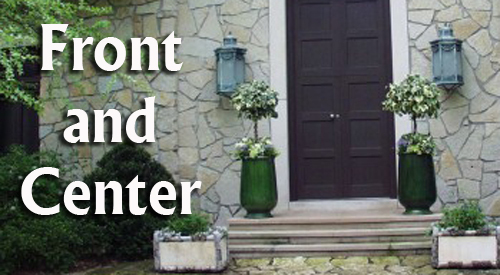 By flanking the entry way with large flowerpots, you create instant curb appeal. When placing pottery at the top or bottom of steps they create focal points. A large, stunning pot containing a plant with good architectural qualities will certainly draw the eye. Used in pairs, pottery containers make good punctuation points when placed on either side of a gateway or entrance. 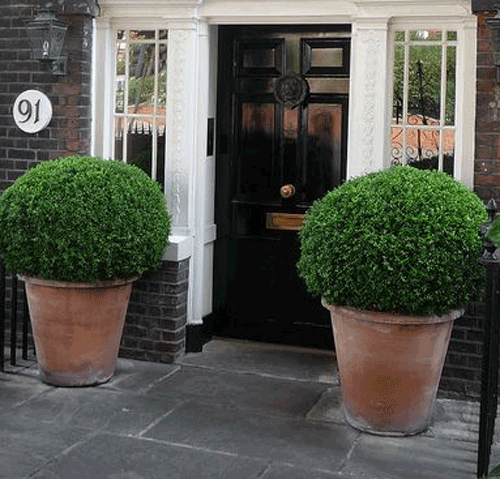 A pair of terracotta pots containing standard box trees flanking a doorway transforms the entrance into something very stylish. Similarly, a pair of pots on either side of the bottom or top of a flight of stairs is very effective. When arranged in groups, garden pottery tend to look best if they are different sizes, especially if the plants at the back are taller than those at the front. In formal settings, a series of matching containers with similar content ca be placed at intervals along a front path or lined up in front of the house. Easy Peasy!!!! Read more.....Planting a cool pot!